Angela Ferguson heads to the Forum Studio Theatre in Chester to watch Tip Top Productions’s latest offering – Beautiful Thing. Photos: Mark Carline. In Tip Top Productions’s latest offering, we are taken from the historic streets of Chester back in time to a 1980s urban cityscape in south east London. It’s the gritty backdrop for a blossoming love story. Teenager Jamie (Jake Cross) lives with his feisty mum Sandra (Sally Dillon) and her younger boyfriend Tony (Theo Spofforth) in a low rise in Thamesmead. His neighbours are Ste (Finn Hibbert) on one side and Mamas and Papas superfan Leah (Brogan Craine) on the other. All of the action here in the Forum Studio Theatre revolves around these three neighbouring flats, with Sandra’s pride in her family home evidenced by a little hanging basket outside the door – her prize for winning the title of 1985 south east barmaid of the year. 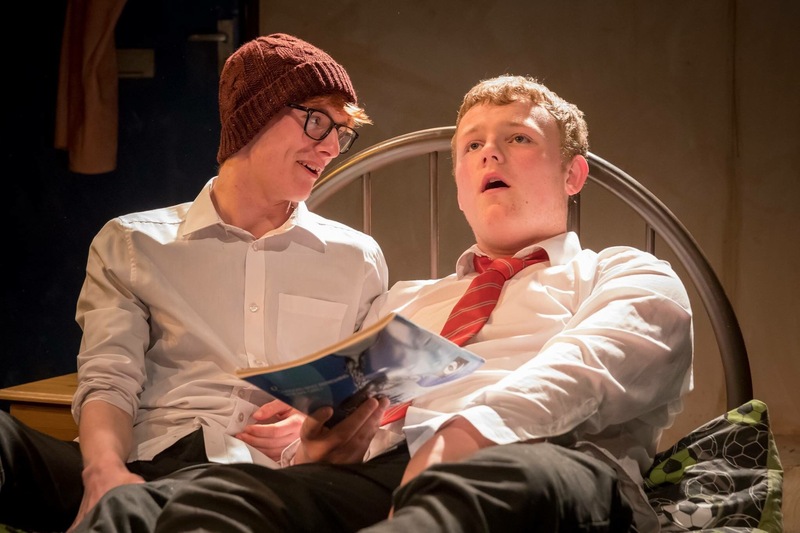 It’s a bittersweet story from the pen of award-winning playwright Jonathan Harvey, with a moving portrayal of the trials and tribulations faced by Jamie and Ste as their burgeoning love story unfolds. It’s all set against a magnificent musical backdrop of the glorious voice of Mama Cass, as blasted out by neighbour Leah. We also witness the at times difficult relationship between the larger than life Sandra and her son and the abuse faced by Ste at the hands of his violent father. It’s a tender, emotional and often humorous look at the lives of these friends and neighbours. There are some extraordinarily poignant moments brought to life by the talented cast and crew, including director Simon Phillips and producer Luke Disley, who have clearly poured heart and soul into this production. And there’s a nice touch with the inclusion of some glorious songs from The Sound of Music. There are also plenty of fantastically comical performances, including Theo Spofforth with his penchant for special herbal cigarettes and Brogan Craine with her obsession with Mama Cass. What more can you ask for. Catch it while you can as there’s a matinee and one evening performance left today (Saturday). There are adult themes in the play, with some strong language used. To book, follow this link to the Tip Top Productions website or call into the box office.